Home › Blog Entry › Would signs help? 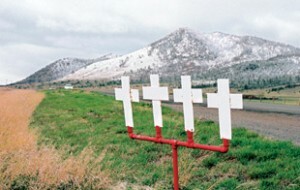 I was driving across the country through the US in the late 90’s and I came across these little white crosses along the side of the road in Montana. Four crosses along U.S. 287 between Helena and Townsend mark the spot where a fatal accident occurred. 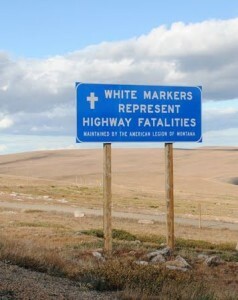 It turns out that these are an official effort to warn motorists about highway safety. Although they assume the victims are Christian, they are otherwise quite effective. As I drove they were a constant reminder that other people, some of them probably good drivers, lost their lives. I know this technique is used in other places as well, notably the North Shore in Capilano and Lynn Canyons. I’ve not been back in a few years but I have vivid recollections of signs along either or both creeks that told the story of previous incidents in the area. One chilling one that I remember the vague details of was about a man who jumped in to save his son, and both drowned. Back in the mind 2000s I was part of the North Shore Avalanche Advisory Committee one winter. This group brought together some of the stakeholders in the industry and was the precursor to the current special avalanche forecast for that area. We would meet once a month with representatives from Parks, Metro Vancouver (then the GVRD), SAR, Ski operations (all three ski hills), and the Canadian Avalanche Association. One evening the topic turned toward prevention of people going out of bounds and the discussion on signage was brought up. There are several signs placed in some of the gulleys on the North Shore, some of which see people getting lost and dying in them with great frequency. One of the most valuable and least recognized programs that North Shore Rescue has is a series of rescue caches in these areas – not equipment for the SAR team (those are rarely used) but special shelters built for any subject that might get lost in the area. Signs tell those lost people where to go and the shelters have saved quite a few lives. Anyway, on this occasion I happened to have that visceral memory of seeing the signs in the Lynn or Capilano areas and I piped up – I suggested that at the head of each gulley system they write the number of people who have died in that gulley. Of course the people in that room were not the people capable of making that decision. The question is, would signs help? There are already signs in those gullies. They are hard to see at night without a headlamp, and often covered in snow. However, my approach to these things is that sometimes it’s just a matter of information. 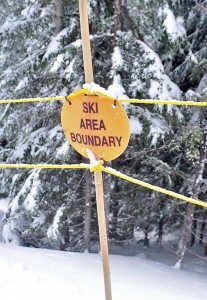 Could a sign placed at the boundary of the ski area, one that is well lit and shaken free of snow every day, serve the purpose? Would it give someone pause before ducking under that rope, would it make the difference between someone being unaware of the deadly terrain waiting beyond the ropes and someone deciding to ski that last run of the day in bounds? We won’t know until one of the ski hills is brave enough to try it.